Snickers Caramel Apple Salad is a deliciously sweet dessert that’s perfect for Fall. 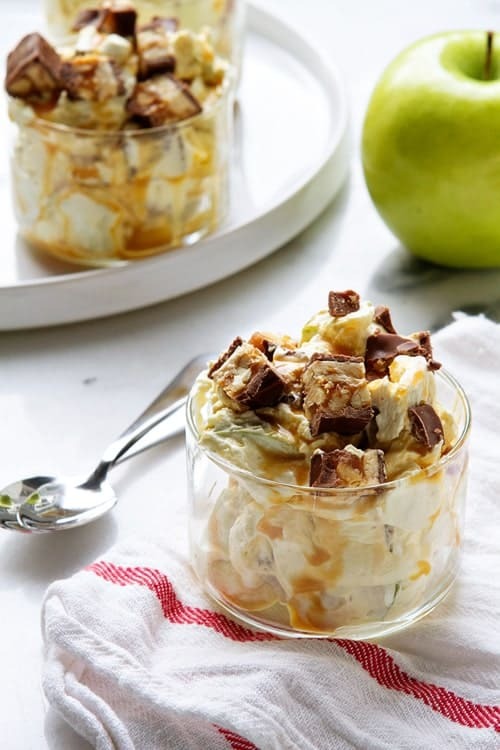 Snickers candy bars are combined with Granny Smith apples, cheesecake pudding, whipped topping and salted caramel sauce – grab a spoon and dig in! A couple weeks ago, we took Elle on her first trip to the apple orchard – complete with apple picking, hayrides, kettle corn (the best I’ve ever tasted) and loads of family. And guess how long she stayed awake? About 20 whole minutes. Basically it was enough time to place her face into a wooden pumpkin cutout for photos, take a brief hayride to the orchard, and snap a few more photos of her picking apples. I consider this a total baby victory. Of course, our conversations centered around apples, apple desserts and the ridiculous about of money the place was charging for pumpkins. Seriously though, $15 for a pumpkin? Slightly crazypants. My aunt brought up Snickers Caramel Apple Salad – a recipe that her friend had given her. She claimed it was so good that she made it twice in one day. Once for a work function and the other to scarf down in the comfort of her own home. Whenever someone tells me they’ve made a recipe twice in one day, it immediately jumps to the top of my must-make list. Now, I am fully aware that calling anything that utilizes Snickers candy bars as an ingredient a salad is quite a stretch, but since there are apples involved, I figured we could all just let the whole salad thing slide. Especially since we fully recognize that this is 100% dessert. 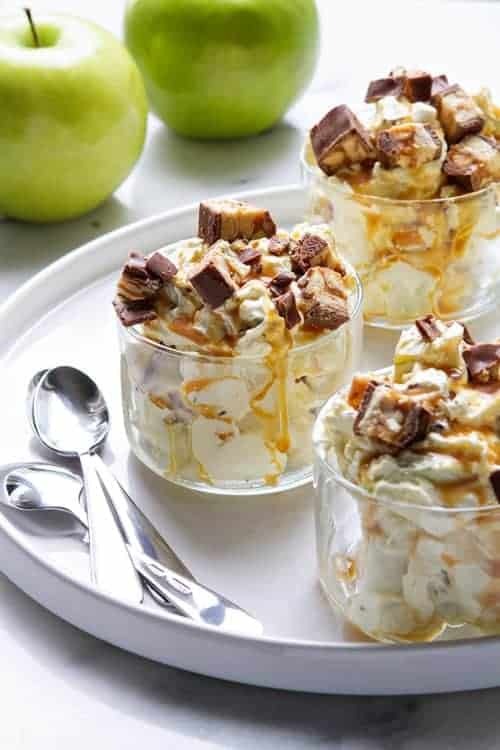 Snickers Caramel Apple Salad couldn’t be easier or more delicious. 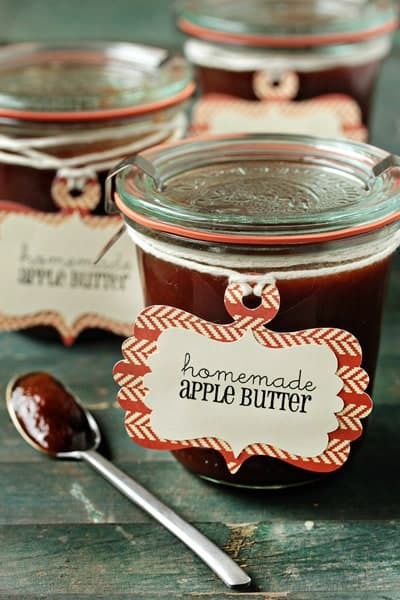 And it’s a great way to use up some of the apples from your own apple orchard adventures. I’ve seen many variations of this recipe online that use different flavors of pudding and candy bars, so I just used what I had on hand. Granny Smith apples, Snickers, cheesecake pudding mix because um, it’s cheesecake flavored, and homemade salted caramel sauce. And it was absolutely amazing. I even let Elle have a couple of bites, since she DID pick 2 apples. 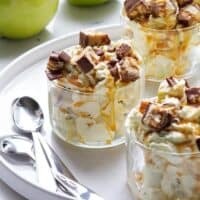 If you’re looking for a simple and delicious recipe to bring to Fall potlucks and parties, Snickers Caramel Apple Salad is just the recipe for you. It’s a few simple ingredients, and since it’s pretty decadent, small bites are totally appropriate. Meaning this recipe can stretch and stretch to feed a crowd. 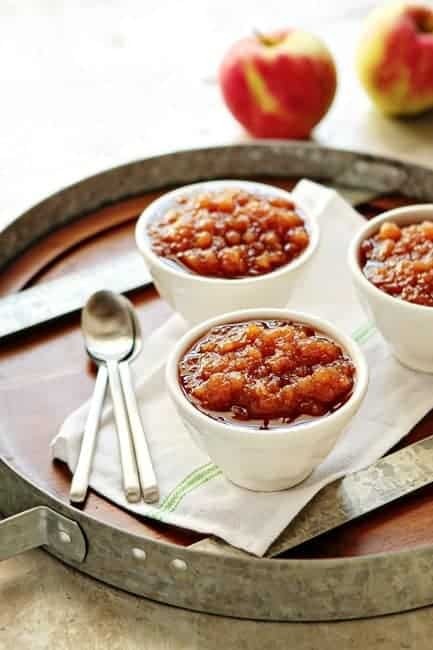 I found that the tartness of the Granny Smith apples and slight saltiness of the caramel sauce tamed the sweetness a bit and in opinion, made this dessert a little more addictive. Now that’s what I call a winner. In a large bowl, whisk together the milk and dry pudding mix. Let the pudding mix set up for about 3 minutes then use a rubber spatula to fold in the whipped topping. Add in apples and Snickers. Before serving, drizzle with salted caramel sauce. 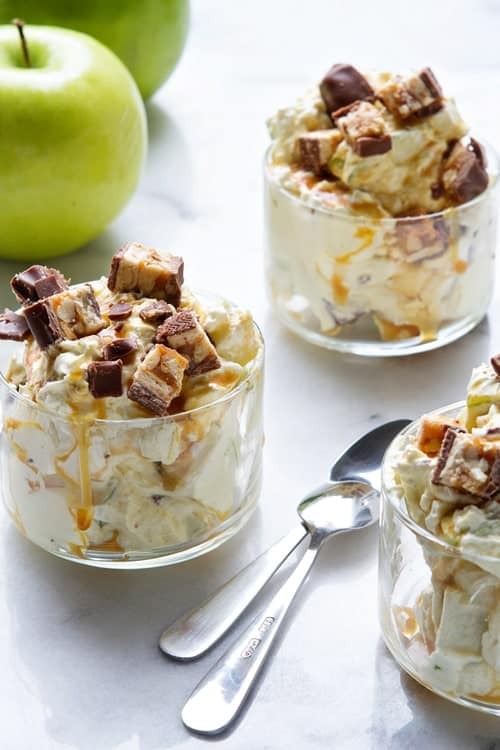 Snickers Caramel Apple Salad is best served the day it is served, but will keep in the refrigerator for up to 1 day. Looking for more apple desserts? 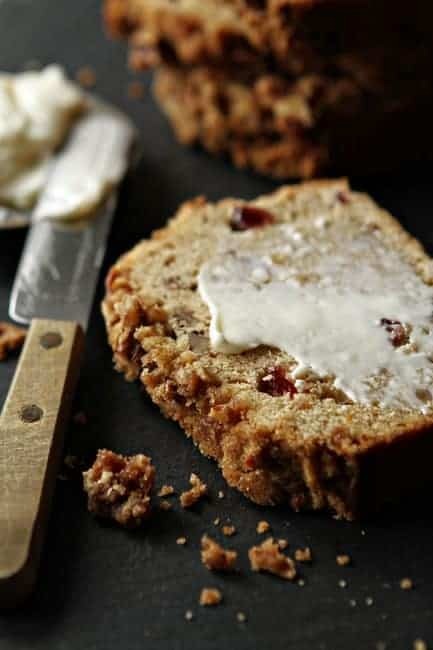 Don’t miss these delicious recipes! Whoa! These look incredibly good! I love apple desserts and you went and added snickers. I’m not sure I can contain myself. I must try this. Pinning! Thanks so much! I appreciate you visiting! Daaaayyy-um! That is truly gorgeous!! Thanks so much for stopping by! It is definitely delicious! What a crazy good idea!!! I love how easy it is to pull together. Mmm snickers. It is so darn good! :) Thanks for stopping by! Snickers salad is one of my favorite things… I love how you fancied this one up! It was seriously delicious. I almost made it again today, but I decided to just eat an apple instead! Thanks for visiting, Kristen! My goodness this dessert looks amazing! Snickers and apple and caramel? Amazing! These jar desserts are just beautiful! Thanks so much. I appreciate you stopping by! Hello. What size jars/bowls are you using? This looks so good. They are these mini bowls – Pier 1 sells something similar as well. Thanks for stopping by! Do you peel the apples? Is it possible to use almond milk or some type of non-dairy milk. I’m lactose intolerant but I would LOVE ot make this! Hi, Emily! I haven’t tried this with a non-dairy milk, but my concern is that it would be a bit thin. I think by adding some cornstarch you could thicken it a bit? I’m honestly not sure, but I’d love to know the results if you give it a try! Do you have to use cheesecake pudding or could you use vanilla?